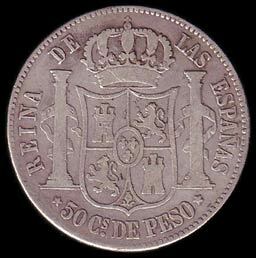 There are few specifically Philippine coins from the Spanish era. This is so, because during most of the Spanish rule of the islands, the Philippines, like all Spanish colonies, used the same Spanish coins as legal tender. The world-famous "peice of eight" (8 reales) was one of the world's leading currencies during most of this time. It was accepted nearly anywhere, from North and South America to many parts of Asia and Europe, even outside the Spanish realm. The first Philippine coins came into existance around 1830. At that time many South American Spanish colonies became independent republics. However, they continued to trade with their former trade partners -- the Philippines being one of them -- but using their new coinage. 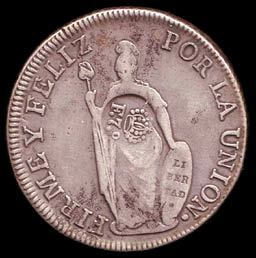 The Spanish authorities were wary that these new coins, which did not bear the profile of the Spanish monarch but carried words like "LIBERTAD" (liberty), would incite a rebellion in the Philippines. To make them "Spanish" issues, they added the seal of the king or queen of Spain at the time: King Ferdinand VII and Queen Isabella II (hence, F7 and YII). These counterstamps were used to legitimize the coins that arrived (as Spain did not recognize those country's independence until several years after). Growing from the Philippines' practise of punching holes in coins (so as to attach them to money belts), coins which bear counterstamps on the holes are extremely rare and desireable. The coins pictured here are from the most common countries known for counterstamps, Peru. Counterstamped coins are the very first coins which are clearly and distinctly Philippine issues. Rare issues include double counterstamps, holed counterstamps, counterstamps on other denominations other than 8 Reales, and counterstamps on gold coins. In 1857, Queen Isabella II issued a degree, ordering the founding of the Casa de Moneda de Manila in the Philippines with the sole purpose of coining gold. It was established in 1861. Issues here ran from 1861 to 1868 in the denominations of 1, 2, and 4 pesos (rare years are 1867 and 1866). These are the very first coins that ever bore the name of the colony: FILIPINAS. In 1864 the operations of the mint were expanded to cover silver. All silver coins with the exception of the 1897 Un Peso were struck here (the latter was struck at the Madrid mint). Silver coins bearing Isabella's image were struck from 1864 to 1868, and then again from a few years after using the 1868 dies (hence the reason 1868 is the most common year for this series). 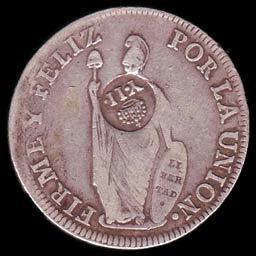 Coins in this issue are very similar to their Spanish counterparts. The only difference was the denomination they had: centimos de peso instead of pesetas. Silver coins bearing the image of King Alfonso XII (who succeeded Isabella) were struck from 1880 to 1885 and are similar to their earlier Isabella counterparts. Here too, minting continued for a few years using the 1885 die. Coins of this issue differ from their Spanish counterparts in the denomination and the fact that King Alfonso faces in the other direction. A very small number of gold coins bearing Alfonso's image were minted. Many mintage years are reported, but only 1882 and 1885 are confirmed. All of these issues from any year are rare. Scanned from a specimen in the collection of Kai Thoma. A new one peso coin was struck in 1897 with the profile of the boy King Alfonso XIII. This coin was only minted for 1 year, and is, at the same time, the first silver coin to bear the name of the Philippines (Islas Filipinas) and the very last coin issued by Spain in the Philippines. With thanks to Dominic Albert for the information, and for providing scans of coins in his collection. I am curious. What types of coins were used by the Spanish traders in the 1600-1700 Philippines? Read all 162 comments by readers. your comments on "Spanish-Philippines Coins"
This article has been viewed 465 times.